Since I started cooking, I have realized I like especially two things when doing so: foods that don't need many dishes that have to be washed afterwards and foods that don't need much of my time. Roasted vegetables fall in both categories. Just a baking tray is needed and apart from cutting the vegetables, I am not needed in the kitchen. I am going to publish quite a few recipes on this blog that include oven-toasted vegetables. They usage is so versatile, be it part of a salad, sandwich, or side dish, be it warm or cold..... either way, they are absolutely delicious. They can also be made in advance and in big amounts and kept in the fridge for various uses. Another reason to just love them. Peel and cut all vegetables in bite-sized chunks. Place them on a baking tray. Chop the fresh herbs and add. Salt generously. Then drizzle 1-2 tablespoons of olive oil over the vegetables and stir thoroughly so that everything is covered thinly in the oil. That prevents it from sticking to the pan. 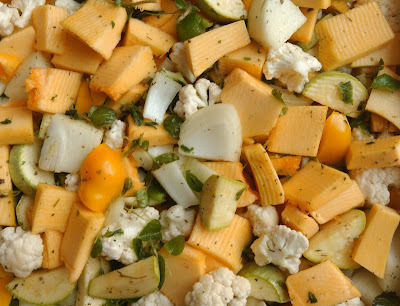 Place in the oven and bake at 250 degrees Celsius for about 20-30 minutes or vegetables are cooked.